Vintage Italia bow tie pasta chips – ermergerd Meatball Parm flavored? Ummm hello, can that sound any yummier? Sorry I like to make up words sometimes when I’m overwhelmed by deliciousness. Wise Cinnabon Popcorn – tried these once before and they do truly taste like cinnabon cinnabuns, mmm yum. Craving one now, thankfully they packed two in this box! Pretzel Perfection twice baked pretzel sticks – these are super yummy, a nice little snack when your craving something savory, love the garlic herb flavor. Watusee Foods rosemary chickpeatos – I’ve never been a chickpea fan before, but this brand is my go-to for those who do love them! Pamela’s Product cinnamon oatmeal & chocolate almond oat up bar – a quick snack that will fill you up for sure, gluten free and organic and they sent two sweet tasting flavors. Tasty Brand sandwich cookies – would never think to try these on my own but the strawberry shortcake flavor is actually quite good! Wonderwell peach water – tried this once before, and its a fun subtle flavor of peach for those who don’t like regular water (that’s me!!!). Pure Growth Organic white cheddar popcorn – mmm I love white ched popcorn, so yummy, can never go wrong. Cosmos Creations premium puffed corn – some fun flavors here, we have coconut crunch and salted caramel, not usually a puffed corn admirer, but this brand is pretty good. Belgian Boys mini cookie stash – MMMMM saving the best for last! My favorite brand of cookies is by far Belgian Boys with their cookie butter everything! I actually just recently purchased a bottle of cookie butter and have been putting it on my rosemary English muffins with a little jam for a yummy breakfast snack. Sign up for their newsletter for 10% off for life! 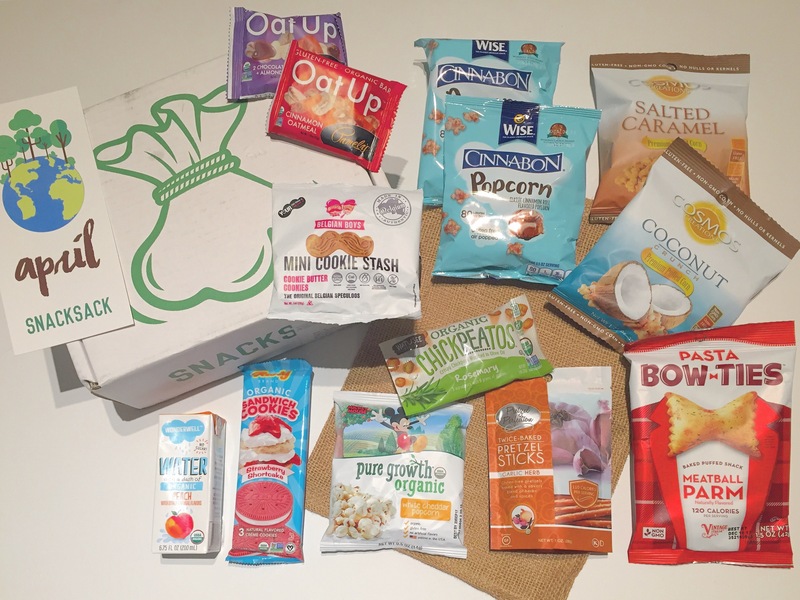 Sign up for a monthly box with 11-15 snacks and free shipping for $24.95 a month, order more often and continue to save!